Photo courtesy of the Spalding County Sheriff's Office. 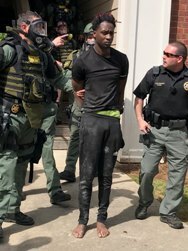 GRIFFIN - On March 29, 2019 at approximately 4:00pm, Investigators from the Spalding County Sheriff’s Office Criminal Investigations Division, Special Operations Unit, CAGE Unit, and Fugitive Apprehension Unit arrested 23-year-old Reginald Collier in connection with the robbery that occurred on March 27, 2019 at the Dollar General Store located at 21 Bicycle Road. According to Sheriff Darrell Dix, “Investigators were quickly able to identify Collier as a suspect and have been working to locate him. at approximately 2:00 today Investigators went to 829 North Hill Street apartment 205 where they learned he had been residing. As they entered the apartment Collier, who was in another room retreated to a closet. While in the closet he accessed the attic of the apartment and refused to come out. Due to his actions we responded our SWAT Team and one of our K-9’s. We set up a perimeter around the building and obtained a search warrant for the residence. When the team made entry, they called to him and he did not respond. He did not respond when he was told the K-9 would be placed in the attic and he would be bitten. So far, he has been charged with one count of robbery, and Obstruction of Officers, with other charges pending. Also arrested was Caleb Barkley, 18 years of age. He has been charged with Obstruction of Officers and Hindering the apprehension of a fugitive. Both are currently residing in the Spalding County Jail.